For the past several Saturdays, individuals from many local churches and faith groups have congregated at 832 Denise Drive in Bryan. But they haven’t come for religious services. They’ve come to build. The Davenport’s new Habitat home is sponsored by a unique group of religious organizations whose aim is to put their faith into action. 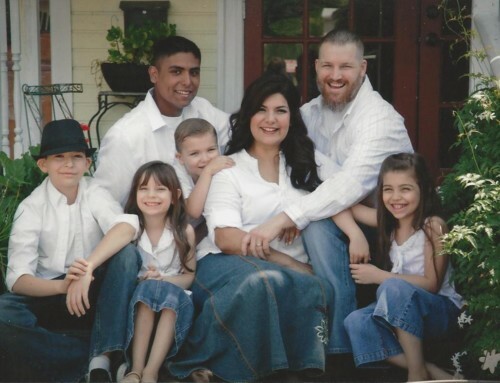 The Interfaith Build invites all groups of faith to join the effort to provide volunteers and funds for the construction of a new house for a family in need. The Davenport home is the second Interfaith Build and the first located in the Faith Subdivision, a new neighborhood of Habitat homes in Bryan. A recent grant from Habitat for Humanity International helped fund Faith Subdivision’s infrastructure – establishing roads, sidewalks, underground electrical service, gas, water, storm drains, sanitary sewer lines and road lighting. The Davenport’s house will be the seventh home completed in the new neighborhood. There will be 20 by the end of the year and 24 when the subdivision is complete. I visited the construction site – a corner plot amid a colorful assortment of neighboring houses – on a beautiful Saturday morning in February. The day’s schedule called for painting the exterior and the interior trim and caulking. Volunteers carrying ladders and paint cans passed me as I looked for future homeowner Chakira Davenport. I found her in conversation with a woman who was halfway up a ladder. Chakira and I introduced ourselves and she offered to show me the neighborhood. As we walked she told me about her experience with Habitat. 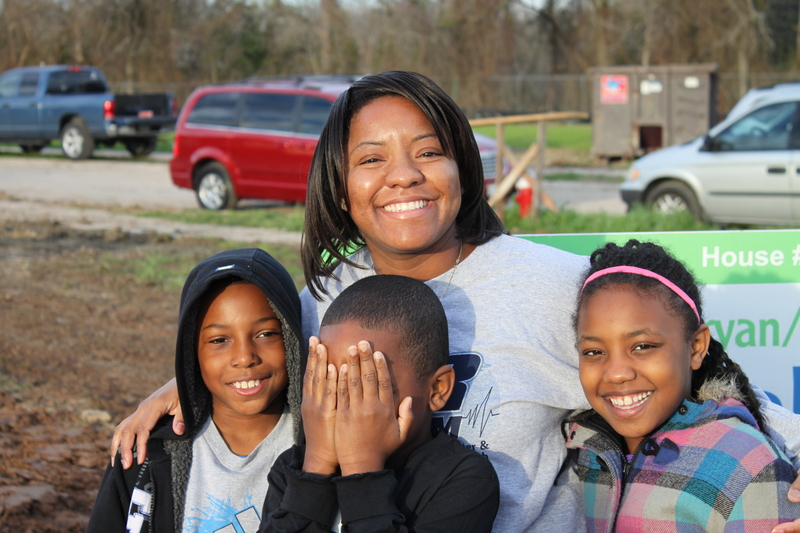 For Chakira, faith has played an important role in her life and journey toward homeownership. She first heard about Habitat from three separate members of her church. When she applied and was approved, she was thrilled. Yunus (second from left) and other volunteers raise the walls of the Interfaith home. As Chakira told her story, we circled back toward her house at the end of the block. Her son, Jaelon (8), carried a hammer and some nails and practiced his construction skills in the grass. Her daughter, Janiya (9), trailed behind us. Chakira sees homeownership as an investment in the future. 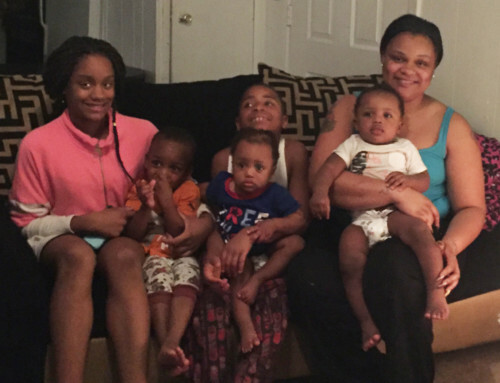 “For me, it’s about providing a stable place for my kids.” Over the past few years, rising rent forced their family to move multiple times, which meant switching schools more than once. “It’s time for our own house,” Chakira declared. When we reached her house, Chakira turned to the property supervisor to discuss the color of the door and trim. “I planned a Tuscany theme,” she explained. We watched volunteers paint the exterior tan, while others worked on the dark teal trim. When the house is finished, a bright red door will welcome the Davenports into their three-bedroom, two-bathroom home. We crossed the soon-to-be-landscaped yard and stepped inside to take a peek. “This will be my bedroom,” Chakira announced as we reached a room in the back. There were three women inside painting. “Oh, is this your room?” one asked. “I’m glad we get to work on it.” Chakira smiled and admired their handiwork. The volunteers on site that morning were from three different churches. The prior week, assistance came partly from the Raindrop House, a Turkish cultural association. Each of the churches and faith-based organizations provides volunteers and food for Saturday workdays. During the week, Habitat staff and regular volunteers work on the house. Tom Woodbury, long-time volunteer, board member, and committee co-chair, described the idea for Interfaith Builds: “It’s a project that grew out of the larger Faith in Action effort.” Faith in Action is a committee that enables multiple churches to jointly raise the $40,000 needed to sponsor a home. So far, Faith in Action has sponsored nineteen homes in B/CS, and formed the backbone of the affiliate in its early days. A few years ago, members of the committee recognized that other faith groups shared some of the core beliefs of Habitat for Humanity. They decided to reach out to other faiths with “strong theological calls to care for the poor and long traditions of providing shelter as a means of helping families move out of poverty.” With this as their driving tenet, the Interfaith Build invites any faith-based organization to join the collaborative effort to sponsor a new home. family, moved into that house in March 2012. 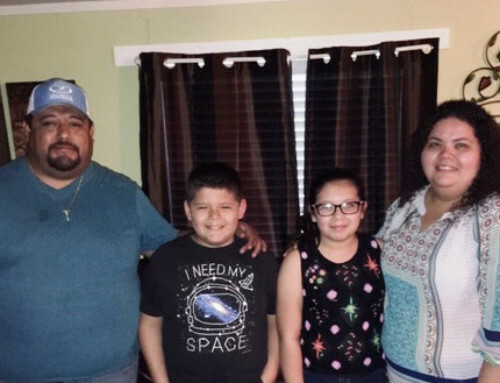 Tom explained that in addition to the Bible traditionally given to families as they move in, the Interfaith group gifted the Alvarados with holy books from other faiths as well. He reflected that the presence of these books in a home symbolizes openness toward learning about different faith traditions. The Institute was founded by Turkish-Americans and their friends in Austin in 2000 and has since expanded throughout Texas and to five additional states. The organization’s first goal was to raise awareness for interfaith cooperation. Now that the Institute is established, its plan is to identify social problems and collaborate with other organizations to address them. Yunus has worked closely with Habitat to encourage members of the Institute and other local groups to put their faith into action through Interfaith Builds. 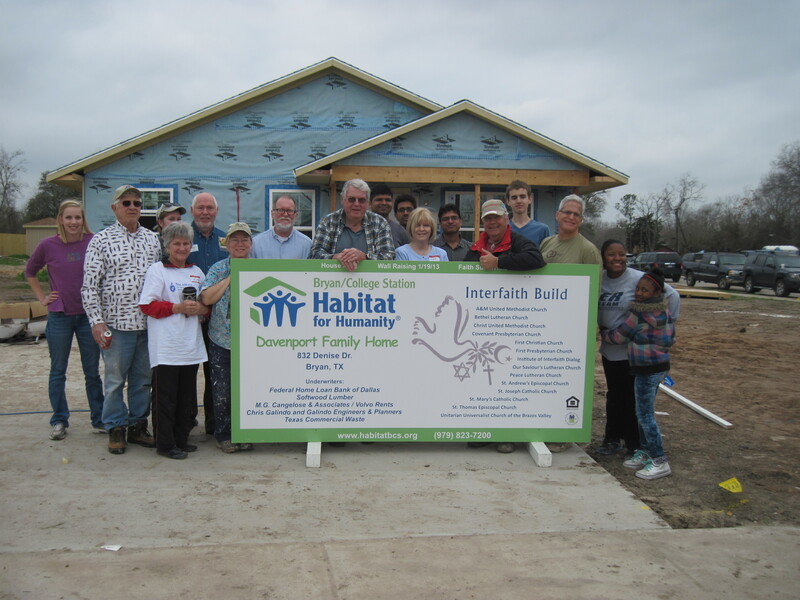 Habitat for Humanity is a Christian organization, but in its goal of sharing God’s love and building community, it seeks to include other faiths. Yunus and other members of the Faith in Action Committee have made efforts to reach out by rewriting Interfaith Build documentation to be more inclusive. They also personally contacted community faith leaders. Yunus identified a larger challenge as finding organizations that are established and ready to create a partnership. He explained, “It’s not that the people aren’t welcoming here – they’re very welcoming – but the population of minority faiths here is small and temporary.” Finding those willing to commit funds and volunteers to longer-term projects is difficult, but the idea is catching on.